Situated next to the main house with 32 acres of beautiful views, enjoy the peace and quiet. Our nightly rental rate is all inclusive. We do not charge additional fees for cleaning, taxes, security deposit, etc. Great property for snowbirds and those looking for an extended stay. Please email us for extended stay rates of 30 days or more. Pool is located behind the main house, a short walk from the cottage & is shared with the owners & their Bulldog Bella who is an avid swimmer and hostess! Please note this property is NOT suitable for young children. This fabulous stone cottage is 5 minutes off of Main Street, 15 minutes from La Cantera/Fiesta Texas and 30 minutes to Fredericksburg! Our cottage, built in 1897, is completely renovated and updated. This elegantly appointed 1-bedroom, one bath, has two private patios to enjoy, including a gas grill and picnic table for outdoor dining. You are also welcome to enjoy the outdoor dining facilities on the pool patio. The fully-equipped kitchen has new appliances including dishwasher and full size washer/dryer. The master bedroom is bright and cheery with flat screen TV and great windows. It has a queen size bed outfitted with custom designer linens, an Art Deco desk, TV and ample storage. The family room features large windows, a comfy sofa, high speed internet for those of you needing to work and cable TV. The family room door opens out to the covered patio overlooking the hen house and 20 acres of natural grass. You'll enjoy watching the deer graze in the mornings and evenings as they venture across the pasture. Enjoy a dip in the pool which is always cool in the summer. We have lots of lounge chairs and floats for your enjoyment or relax and read your favorite novel while enjoying the peace and serenity of your surroundings. Feel free to explore! Take a walk to the hen house, garden, creek or say hi to our very friendly English Bulldogs, Bella and Watson ,and our Great Dane George! Need more room? Visit our other listing on property--"Private Estate" VRBO# 682768. It' a 2 bedroom, 1 bath apartment on same property. Beautiful contemporary shower and soaking tub. Ample storage for toiletries, beautiful high ceiling, stained glass window and chandelier. Main Street in Boerne is less than 2 miles. Boerne Lake is 1.7 miles and has kayaks for rent on the weekends. Overlooks 32 acres of natural grass, deer and other wildlife. Bed linens, extra pillows and blankets are provided. Full size Bosch front load washer. Laundry detergent provided. Full Size Bosch front load dryer. Dryer sheets provided. Parking in front of cottage. Ample bath towels and pool towels are provided. Newly furnished mid-century modern living room with 42 inch TV. New Bback Samsung with sanitize option. New GE ceramic stove with 5 burners. New GE with convection bake, timer, delay option and self cleaning. New LG with auto touch--defrost, reheat, cook, etc. Cuisinart Keurig Brewed with coffee pods, sugar and creamer. Cuisanart toaster oven--warm, toast, bake, broil or pizza options. Coffee pods, sugar, creamer, salt, pepper, olive oil. Filtered water. Fitz & Floyd "The Ritz" place settings for 8 including utensils & service ware. Juice and wine glasses. Outdoor plastic plates, bowls and glasses are provided for dining "al fresco". Kitchen renovated in 2018. Granite counters & new appliances. Keurig coffee maker, toaster oven. Fully equipped with dishes, silverware, cooking utensils, pots & pans. Outdoor gas grill. Cream marble dining table with 4 matching leather chairs. Private front and back patio with seating. Pool is shared with owners (and Bella, our bulldog) who live on property. Hot tub is shared with owners who live on property. We stayed at the cottage for a month. (ask about the monthly rate,it is great)Fabulous location & great hosts.We loved the close proximity to both Boerne & San Antonio! Great golf courses close by & wonderful shops & restaurants. The farm atmosphere is wonderful, loved the chickens, & the dogs. So enjoyed the Texas hospitality!Hopefully we will return! This cottage has everything you need to feel at home! I am so glad I chose this cottage for my getaway. The grounds are beautiful, I loved watching the chickens roam around. It was a great spot for some serious relaxation. Unfortunately, I didn’t have the weather I wanted to enjoy the pool, but enjoyed lots of downtime reading in the cottage and on the patio nonetheless. It is close to I-10, but for me the sound of cars was a white noise that kept lulling me back to sleep in the morning. A very short drive to Main St. Boerne for shopping or dining. I would definitely stay again, hopefully with better pool weather! Thank you guys! I loved it! Easy access to either side of Boerne, comfortable and has every thing you need. The hosts were great and were available if you needed anything. Boerne is a great place to visit, or live. Highly recommend! From the description and the pictures, I thought this was a private and peaceful vacation rental. We enjoyed the cottage itself — it’s lovely. 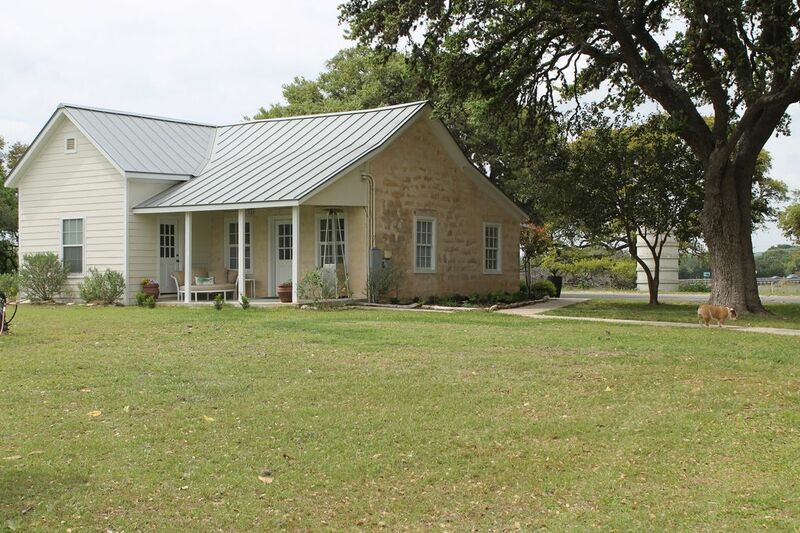 I’m a 6th generation Texan and a history buff, and I truly enjoyed the old German home. I only get a few days away each year to vacation and try to relax. Unfortunately, during our stay, there was a lot of maintenance going on at the property. It really detracted from the use of the property, especially if you want a peaceful and private stay. We arrived on Tuesday night and everything was great. On Wednesday morning, builders arrived to install a fence around a large garden. This involved a compressor, nail guns, and a boombox with loud music outside the cottage. I didn’t feel we could stay at the property and privately or peacefully use the outdoor areas while the fence-building was occurring on Wednesday, so we made plans to do other things away from the property during the day, while the builders were around. Toward dinner time, after we returned, I asked the owner if she would have the builders turn off the music, and she did, which was kind of her. The owner texted me that the fence building would end Wednesday. On Thursday morning, the builders were back to erect a fence around the garbage bins. So we left the property again that day. Later that evening, I texted the property owner, and during that conversation, I indicated we would probably be using the pool Friday morning, one last time, before leaving. When we arrived at the pool Friday morning, there was pool maintenance occurring. Tools were stacked on top of the diving board and they were using a loud compressor (or similar) off and on. So we cut that activity short and just decided to look around the property itself, then go back to the cottage and pack up to leave. My advice would be to ask the owners how much maintenance will be occurring during your stay, BEFORE you book. I really wanted a peaceful and quiet vacation. From the pictures and the description, I envisioned that this property had more of an isolated country feel. However, this property is literally right next to Interstate 10. I didn’t really understand that fully until we arrived. You can’t tell how close the property is to I10 until you receive the address, which happens after you book. You will hear the humming of cars and tractor trailers inside the cottage. I wish there was a white noise maker available to use at night. The cottage itself is lovely. I appreciate your comments and am sorry your stay wasn't as enjoyable as you would have liked. As you can imagine with a 10,000 sf home on acreage, regular maintenance is required. We actively coordinate maintenance and upgrades around our guest schedules. Unfortunately, there are times when scheduling doesn't permit that with outside contractors. During your stay the only maintenance was erecting a fence around the garden and trash receptacle which was scheduled for Tuesday but got pushed back by the contractor to Wednesday due to rain the week before. All the fencing was completed by 10am Thursday morning. When you returned from visiting Main Street you asked to have the music turned down. In our opinion the contractor's music was not loud at all, but as soon as you brought it up, we took care of it within minutes. As far as the pool, Frank, fastidiously maintains the pool so it is clear, clean, and sanitary at all times to make it enjoyable for all who use it, as I'm sure you noticed. This is always done early in the mornings, long before guests are even aware it occurred. During your stay, Frank had to replace the pool light that took a little longer than expected. We are sorry your stay wasn't as enjoyable as you'd like and hope your next vacation meets your expectations. Kayaking on Boerne City Lake is only 1.7 miles away. Kayaks are available to rent on weekends. Picnic facilities, walking trails, swimming area. Great place to relax and enjoy the views!